Politician and Freedom Fighter. Revolutionary leader of the Mozambican liberation movement FRELIMO and Mozambique's first President, killed in a controversial plane crash in 1986. Samora Machel was born in 1933 and was raised in the village of Chilembene. He was a member of the Shangana ethnic group and his parents were poor. Machel parents were forced to grow cotton by the Portuguese, rather than food such as corn which they could eat. In the 1950's his parents' farmland was taken and given to Portuguese settlers. In order to avoid starvation, his relatives went to work in the South African mines under repressive and dangerous conditions. Soon after, his brother was killed in a mining accident. Machel attended Catholic school and when he was not in class he worked in the fields. He studied to become a nurse, one of the few professions open to Mozambican Blacks at that time. Machel was attracted to Marxist ideals and began his political activities in a hospital where he protested that the black nurses were paid less than whites, who were doing the same job. He later told a reporter how bad medical treatment was for Mozambique's poor by saying, "the rich man's dog gets more in the way of vaccination, medicine and medical care than do the workers upon whom the rich man's wealth is built." Rebellion against Portugal was not new to Samora Machel. His grandparents and great-grandparents had fought against the Portuguese in the 19th century. In 1962 Machel joined the Front for the Liberation of Mozambique or FRELIMO, as it was called by most. FRELIMO was dedicated to creating an independent Mozambique. In 1963 Samora Machel left Mozambique and travelled to several other African nations where he received military training. In 1964 he returned to Mozambique and led FRELIMO's first guerrilla attack against the Portuguese in northern Mozambique. Machel spent most of his time in the field with his men, leading them in combat and sharing their dangers and hardships. By 1970 Samora Machel became commander and chief of the Frelimo army. He believed in a guerilla war and Frelimo's army established itself among the poor in Mozambique's. He was a revolutionary who was not only dedicated to throwing the Portuguese out of Mozambique but also radically changing the society. He said, "of all the things we have done, the most important - the one that history will record as the principal contribution of our generation - is that we understand how to turn the armed struggle into a Revolution; that we realized that it was essential to create a new mentality to build a new society." Machel's goals were to be realized. The revolutionary army weakened Portugal, and after the country's coup in 1974, the Portuguese were forced to leave Mozambique. The new revolutionary government, led by Machel, took over on June 25, 1975. Machel became independent Mozambique's first president and was affectionately referred to as "President Samora." Machel put his revolutionary principles into practice. As a Marxist, he called for the "nationalization" (government ownership) of the Portuguese plantations and property. He moved quickly to have the Frelimo government establish public schools and health clinics for the poor. He called for Frelimo to organize itself into a Leninist Party. Samora Machel supported and allowed revolutionaries fighting white minority regimes in Rhodesia and South Africa to operate within Mozambique. Soon after Mozambique's independence both of these countries attacked Mozambique with an anti-Frelimo organization called RENAMO. RENAMO's activities included: the killing of peasants, the destruction of schools and hospitals built by Frelimo, and the blowing up of railway lines and hydroelectric facilities. The Mozambique economy was strangled by these depredations and began to depend on overseas aid - in particular from the Soviet Union. Nonetheless, Machel remained popular throughout his presidency. 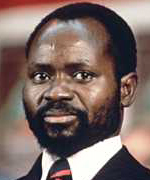 Samora Machel was awarded Lenin Peace Prize in 1975-1976. On October 19, 1986, Samora Machel was on his way back from an international meeting in Zambia in the presidential Tupolev Tu-134 aircraft when the plane crashed in the Lebombo Mountains, near Mbuzini. There were nine survivors but President Machel and twenty-four others died, including ministers and officials of the Mozambique government. Although several years before the aeroplane went down Machel had signed a non-agression pact with South Africa, there was widespread suspicion that the apartheid regime was implicated in the crash. On October 6, 1986, just two weeks before the crash, South African soldiers (SADF) were injured by landmines near the spot where the borders of Mozambique, South Africa, and Swaziland converge. This site was very close to where the Tupolev Tu-134 went down. Time magazine noted that this "really seemed too much a coincidence". Throughout southern Africa, angry people mourned the loss of Samora Machel. In South Africa, protestors blamed their government for Machel's death. In Zimbabwe, thousands of youths stormed through downtown Harare. The crash remains a mystery: with some blaming it simply on bad weather and others still believing in South Africa's guilt. No conclusive evidence to either effect has yet emerged.